Coiba is a designated UNESCO heritage site brimming with wildlife. Due to the fact it was a prison until 2004, Coiba is relatively untouched and pristine. 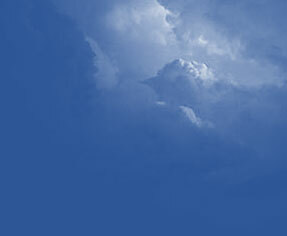 In recent years there is inceased human activity via tours, visiting cruise ships, school groups and research. Operators and visitors need to be diligent in treading lightly to ensure the ecological integrity of the area. Practices such as taking only photos, leaving no trace, not getting too close when observing animals, being mindful when snorkelling/diving to prevent sand clouds or touching reef, motor boats going slow within the park, and travelling in small groups are all important. We all need to do our part to ensure this park maintains it's unique character and thriving ecosytems and that the avifauna, flora and fauna continue to flourish. 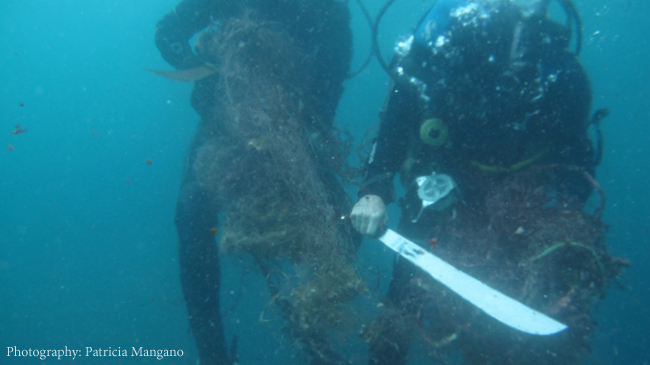 Ben Harris removes hundreds of meters of fishing net from La Ballena ,Contreras. 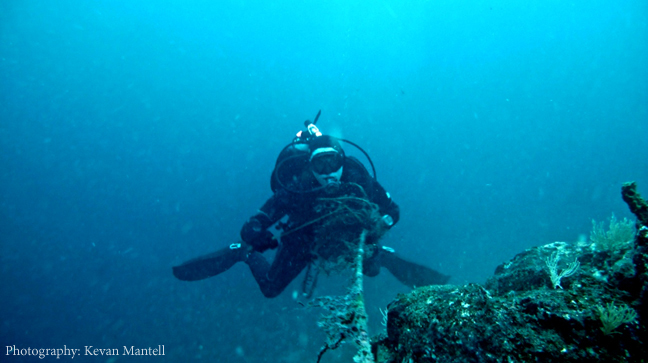 In this effort, a team of 7 professional divers and two assistants from dive operations located in Pixvae and Santa Catalina removed several large monofilament nets and numerous long lines from 5 of the Coiba National Parks “signature” dive sites: The Monster, La Ballena, La Montana Rusa, Bajo Joshua and Isla Iglesias. 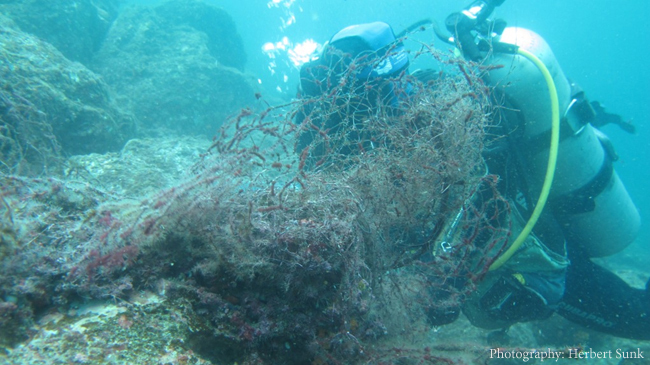 These nets and lines presented a significant threat to the marine flora and fauna and the health and safety of the users of these sites. Work was carried out during very difficult weather, navigation conditions and strong currents. 3 dives per day were made by each diver on each site. 18 dives required technical dive equipment and staged decompression as they exceeded permitted depth and time limitations of recreational diving. Depth ranged from 110ft to 150ft. Adrian Suldana, La Ballena, Contreras. 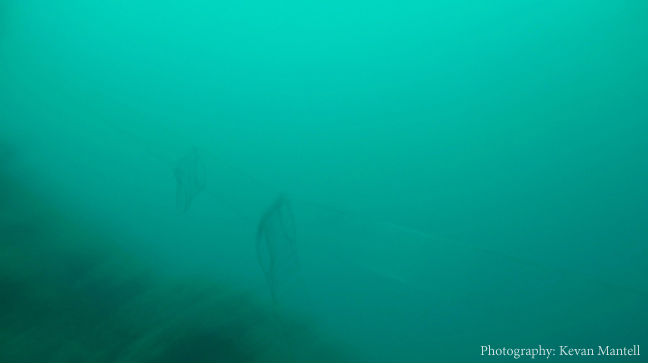 Phantom Fishing net, abandoned and still fishing, Monster. 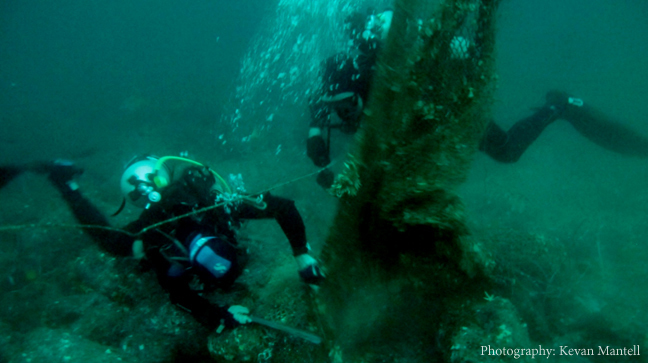 Large portions of the nets were cut and removed from the water column, rocks and deep-water black corals. 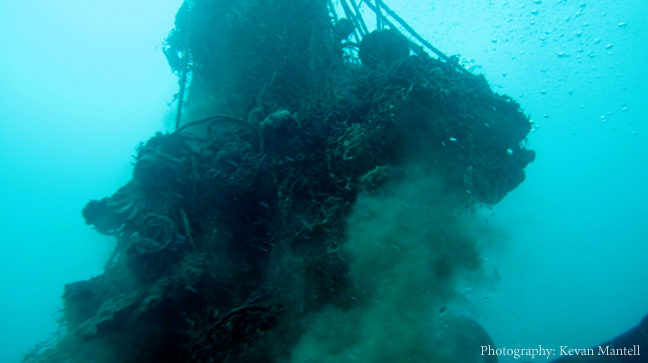 All pieces of the net were sent to the surface using air filled lift bags and collected by the crew of the dive boat. 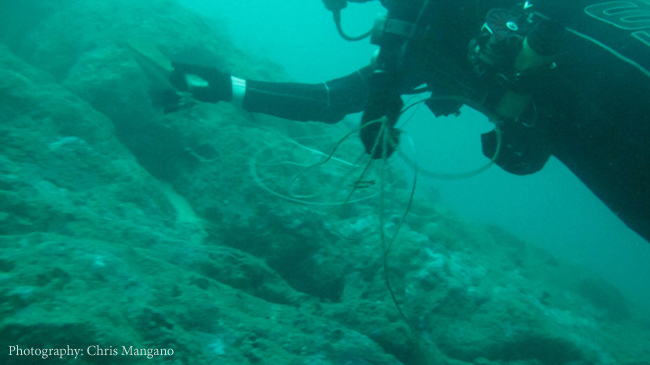 Ropes, buoys and monofilament long line were cleaned from all areas of the sites during this operation. All dead animals were cut out of the net prior to sending the nets to the surface. Chris Mangano, The Roller Coaster. Herbie Sunk and Chris Mangano, The Roller Coaster. Contreras. Ben Harris and Chris Mangano, Bajo Joshua. Isla Canales Afuera. 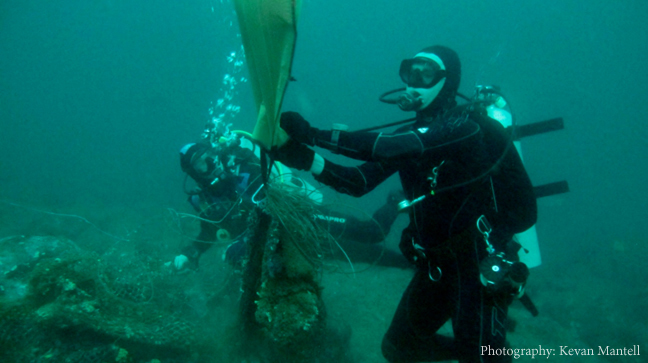 The mooring buoy recently installed on one site, Bajo Joshua, to allow dive operators access to the site without anchoring, was found in 140ft of water, tangled in the fishing net. The net and strong currents had submerged the buoy. The buoy was refloated after cutting the net from around the complete system. The dive buoy installed on the site had lost its buoyancy characteristics due to being immersed in over 140ft of water for a period of almost 1 month. The water pressure crushed the expanding foam that forms the buoy. An additional buoy was donated by the Smithsonian and installed on the site until such time as the old buoy can be replaced. Kevan Mantell and Chris Managano, Bajo Joshua. Isla Canales Afuera. 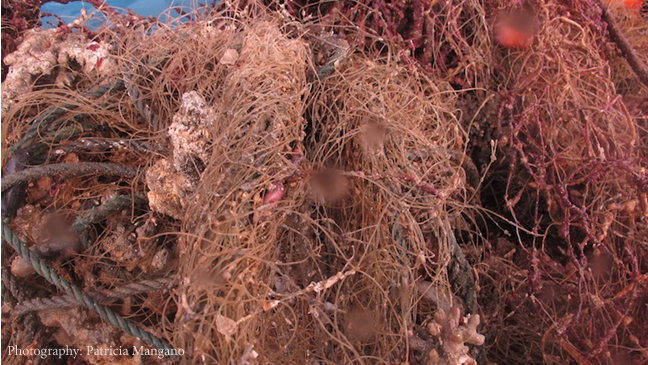 Part of the net from Isla Iglesias, Rancheria, Coiba. All above-mentioned sites, at time of writing, are now free of all kinds of fishing debris and can be used by the dive and tourist operators safely. However with increasing illegal fishing in the Coiba area and unsustainable fishing practices, abandoned nets and long lines are increasing in the area, presenting a ever-present danger for marine life and tourism activities. Miles of long line, clips and hooks were removed from various sites. 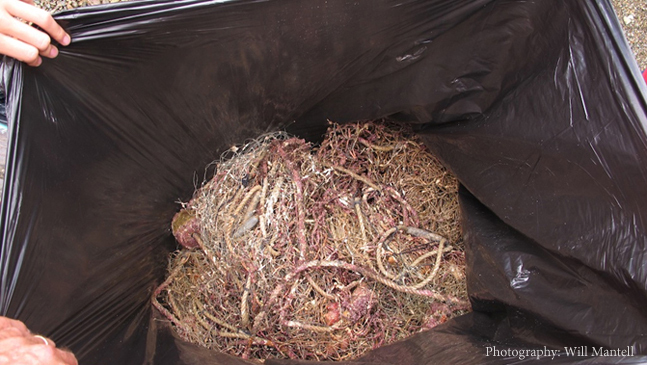 All nets, lines and ropes retrieved from the site were taken to Pixvae for responsible disposal. This equipment could not be burned because of local health rules concerning burning of plastics. The nets, long lines and rope were cut in pieces and buried. All stainless steel hardware was smashed and the metal given to the school director to be sold for scrap to raise funds for the local school. One of miles of monofilament long lines removed. Alfredo, Kevan, Chris and Herbie. 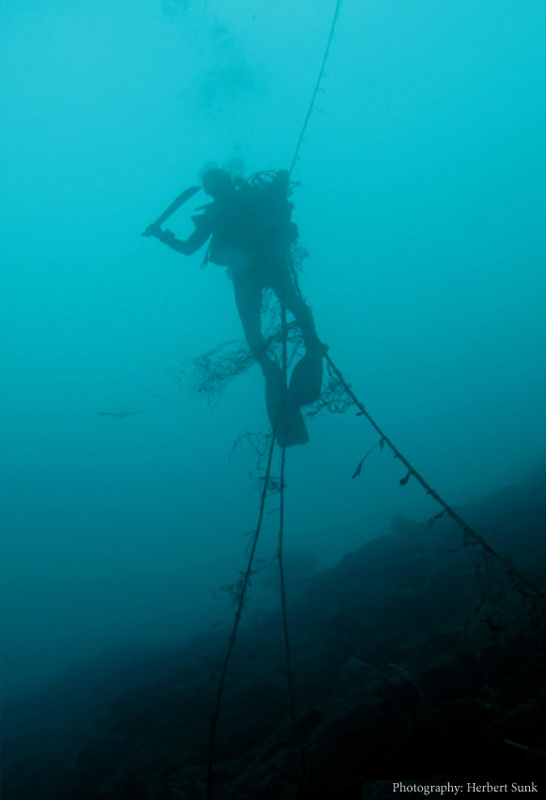 The project was extended by two days because of bad weather conditions and the additional work to remove the net and the dangers of entanglement for divers and refloat and install the additional buoy, donated by the Smithsonian Institute, on Bajo Joshua, one of the most frequented sites in the CNP. Part of the large net removed from the Monster. Herbie, Ben and Chris. 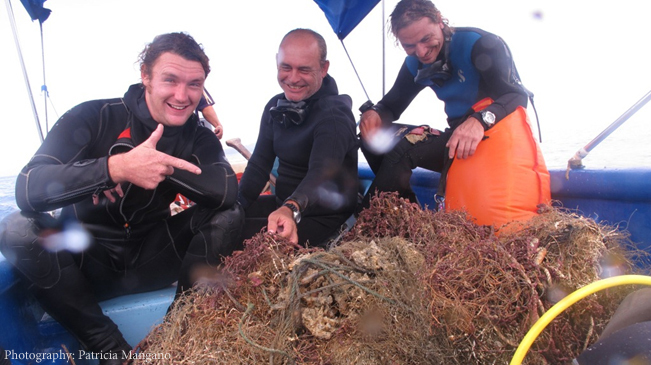 Part of net removed from Bajo Joshua, unfortunately full of dead corals and marine life. The owner of Rancho Estero in Santa Catalina (www.ranchoestero.com), Kevan Mantell and Herbert Sunk all made kind contributions that made this initiative possible. Participant Divers and project assistants- Divers: Kevan Mantell, Herbert Sunk, Ben Harris, Chris & Patricia Mangano, Adrian Sultana, Alfredo de Leon. Assistants: Luz Tenorio and Will Mantell. Kevan Mantell set up all logistics and pertinent permissions and dealt with all authorities and the Smithsonian Institute to complete this initiative. Dr. Juan Mate of the Smithsonian Tropical Research Institute donated the use of their facilities on Isla Rancheria for use of the group during the operation. The national environmental authority, ANAM, kindly waived entrance and anchorage fees. Processing and destroying the fishing equipment in Pixvae. 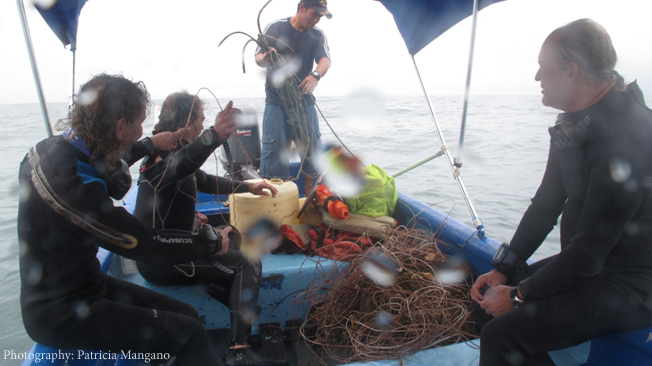 One of the complete nets removed from La Ballena, Contreras. As stated before, illegal commercial, artisanal and sports fishing are becoming common practice and a chronic problem in this Marine Protected Area. Further efforts will no doubt be required in the near future, as illegal depredation of diminishing marine resources continues in the region. In total, seven bags of net and 2 bags of long line were destroyed and buried in Pixvae. The dive operators and community of the Coiba National Park would like to extend their sincere thanks to everyone who made this possible. The dive professionals of this area are an organized and environment conscious group who jointly assist in making the Coiba National Park a safe destination for dive and water activities. Also protecting the marine bio-diversity of this spectacular, unique and profoundly important area. Efforts that support and promote the health and natural balance of the broader marine eco-region, the Tropical Eastern Pacific Biological Corridor, of which the Coiba National Park, its islands and archipelagos are the “keystone”. 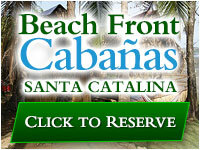 For more information, please contact info@coibanationalpark.com.